Jane Gloriana Villanueva finally has the wedding she always dreamed of in Jane The Virgin’s second season finale, and it’s one of the most poignant, joyous events of this past TV season. The wedding is overflowing with warmth and love, and “Chapter Forty-Four” does exceptional work realizing the emotional impact of the event on both the title character and the people around her. The person hit hardest is obviously Jane, and her gratitude to her family and affection for her new husband are fully captured in Gina Rodriguez’s performance. She radiates compassion, and those feelings resonate through the viewer to make for an especially heartfelt wedding ceremony and reception. 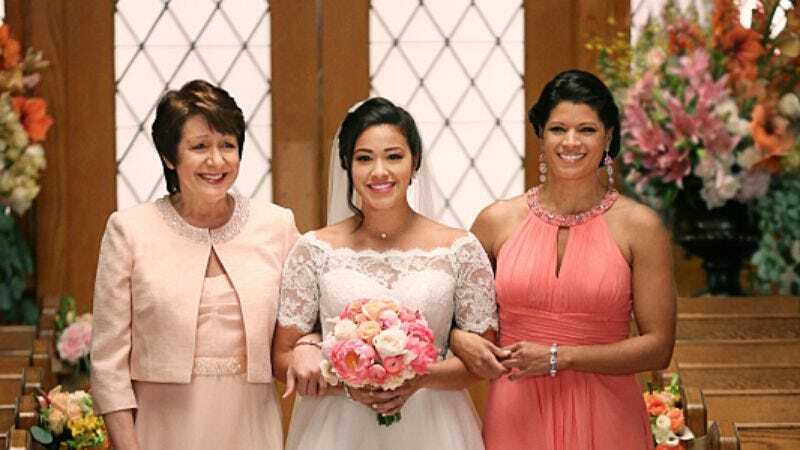 In typical Jane The Virgin fashion, plenty of complications arise in the 24 hours leading up to Jane walking down the aisle, but each new hurdle just makes it all the sweeter when Jane finally arrives to the church. These hurdles also represent Jane’s various challenges over the course of this season: Her advisor wants her to present her new master’s thesis idea before the ceremony, representing Jane’s struggle to balance her education with her increasingly hectic personal life. Jane panics when Michael books a far too expensive hotel room for their first night together as a married couple, representing Jane’s fears about financial stability. Jane and Rogelio have to take the bus when the Rolls Royce he plans to drive Jane to the church in breaks down, representing Jane being caught between two social classes. The ideal wedding features a touching ceremony celebrating love on an intimate level before a reception that celebrates love on a larger scale, and that’s exactly what Jane The Virgin delivers. After seeing everything Jane and her family have gone through, it’s hard to hold back tears from the instant she begins walking down the aisle with her mother and grandmother at her side, and the feels just keep coming, reaching their peak when Michael delivers his vows in Spanish. It’s a beautiful ceremony, and it ends with a refreshing rush of humor as the choir and audience begin to sing about how Jane can finally get laid, a shift that highlights how monumental a deal this is for Jane and Michael. The wedding is extremely romantic, but the emotions of the event are heightened because the script gives equal emphasis to familial love, showing how important this moment is to Jane’s mother, father, and abuela. Alba plays an especially huge role in the narrative, and the episode begins with a flashback to Alba telling young Jane a fictionalized, idealized account of her wedding, reinforcing how Jane’s childhood interactions with her grandmother influenced her expectations for her life. Jane and Xiomara’s relationship gets more attention on this series than Jane and Alba’s, but it’s important to remember that the series began by introducing Jane and Alba’s dynamic first, and the strength of their connection is the thing that makes Jane’s commitment to her virginity believable. Religion plays a part in that, too, but Alba has also been essential in building Jane’s religious foundation and keeping her granddaughter on the faithful, chaste path that Xiomara strayed from. Jane’s wedding is a big moment for Rogelio and Xo, but it’s even bigger for Alba, who sees all her dreams for her family come to fruition in Jane. Alba was able to prevent Jane from making the same mistakes she made, and this perfect wedding is the prize for that effort. And it is perfect; more perfect than Jane could have imagined. She gets the opportunity to dance with her father at her wedding, something she never expected to happen as a child, and Rogelio invites his third best friend, Bruno Mars, to sing the song for Jane and Michael’s first dance. It’s a fairy tale event, and all the work leading up to the wedding pays off big time. Jane The Virgin has been building to Jane and Michael’s wedding from the very first episode, and the finale is full of callbacks to earlier chapters. Just like in the pilot, the opening Jane and Alba-centric flashback is immediately followed by a scene of Jane and Michael intensely making out, scored by aggressive percussion that accentuates their passion for each other. These callbacks make “Chapter Forty-Four” feel like an episode that closes a loop, wrapping up major threads that have been present since the start of the series. At least that’s what it looks like until the last 5 minutes, which knocks everything out of whack with a series of cliffhangers that drop major bombshells for nearly everyone in the cast. The big telenovela twists are an essential part of this show’s DNA, but they also get repetitive after a while and start to feel like an intrusion on the more substantial material focusing on Jane’s more grounded personal drama. The majority of the finale’s plot exists on this more relatable narrative level, but there’s a surge of telenovela fantasy in the final moments as writers Jennie Snyder Urman and Paul Sciarotta set up next season with some big cliffhangers. The first involves Petra, who finally discovers Anezka’s twisted plan to replace her when she’s drugged, put in a vegetative state (#Petrafied), and has her hair dyed so she looks like her evil twin. It’s a chilling twist rooted in two telenovela tropes—evil twins and comas (although Petra’s not technically in a coma)—and it immediately introduces a lot of future problems for Petra and Rafael when Anezktra seduces Rafael under false pretenses. As many predicted, something horrible happens to Michael at the end of the episode, and his duplicitous former partner Susanna Barnett shoots him when he leaves his hotel room to get some ice. While I’d like to believe that this show isn’t so heartless that it would kill Michael on his wedding day, there’s still the possibility that Michael is dead, which would take this series down a very dark path in season 3. Considering how quickly Mateo’s kidnapping cliffhanger was resolved, I predict that Michael is going to survive but spend quite a bit of time in the hospital, further delaying Jane losing her virginity. The last big twist comes via Susanna Barnett, who reveals to Luisa that she’s been Rose all along, and it’s a prime example of how these telenovela twists often repeat the same beats with slight variations. It’s another mistaken identity reveal, and bringing back Rose feels like moving backward into the crime boss drama that is the least compelling element of the series. As this episode proves, Jane The Virgin is at its strongest when it stays down to Earth, and hopefully the writers will find a way to explore Rose and Luisa’s storyline on a more personal level. Given this show’s unbroken winning streak over two seasons, I have faith that all of these crazy developments will lead to powerful stories, but I do wonder how long the show can effectively incorporate telenovela elements before they becomes tedious distractions from the real meat of the series. Jane’s new thesis is a romance loosely based on the story of her grandparents, set in Venezuela, exploring class differences, religion, and sexual stigma with bilingual elements. She’s getting closer and closer to writing Jane The Virgin, and I predict that by the end of the series we’ll discover that our Latin Lover Narrator is being controlled by Jane the writer. I’m very impressed by Rafael’s maturity this week, and despite his urge to tell Jane he loves her, he keeps his mouth shut so he doesn’t ruin her wedding day. That gives me a lot of respect for him. Xiomara is pregnant with Esteban’s baby! I wonder if she’s going to have an abortion. I feel like this show would handle that subject with a lot of sensitivity. Young Alba looks a lot like Gina Rodriguez. The casting for the Villanueva women at all ages is impeccable. I hope Rafael realizes Anezka is masquerading as Petra because he catches her dropping an Annie reference.